Dermaquest's collections provide luxury care, rich in botanical stem cells, peptides and vitamins, with hydrating and protecting ingredients that are vital for maintaining skin integrity. Dermaquest's products and facials do so much more than prime and pamper the skin. 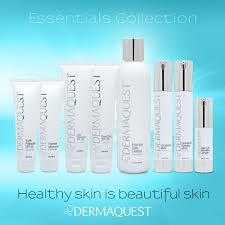 Dermaquest have 8 different skin care collections, designed to target different skin types and condition for home use. We also provide 16 salon treatments which range from standard no-prep facials to resurfacers. Ideal introduction to Dermaquest facials as No prep is required. Power Peptide/ Power Pumpkin/ Glycolic Acid Level 2. Ultimate resurfacer progress onto these facials from Level 1 resurfacers.